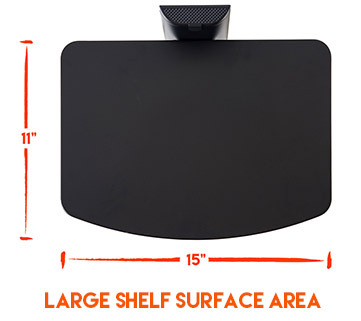 You no longer have to worry about where you TV accessories will go with ECHOGEAR AV Shelves. Unfortunately, you still have to worry about where all your grandmothers antiques will go, but let's worry about that later. 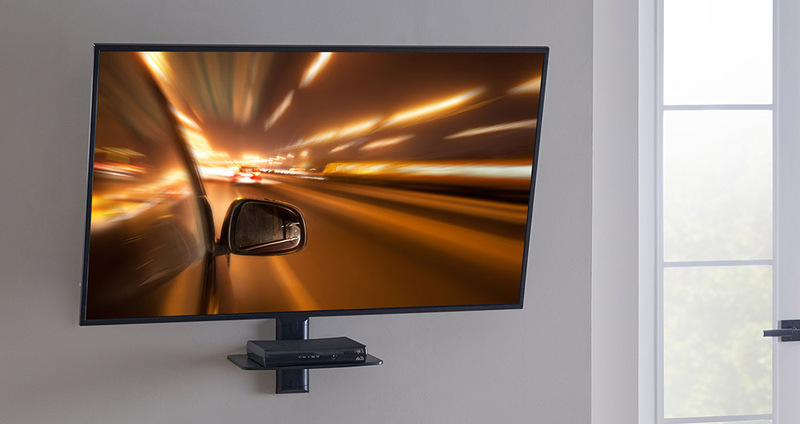 ECHOGEAR AV shelves allow you to place your cable box, Blu-Ray player, and all of your other TV necessities close to your TV. 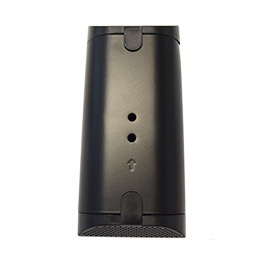 If that wasn't good enough, the sleek black finish flows with your homes feng shui, keeping you at peace and allowing you to live the life you've only dreamed of. ECHOGEAR AV shelves - changing your life, one component at a time. 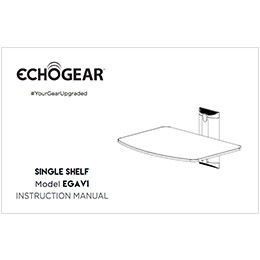 ECHOGEAR AV shelves are compatible in wood, concrete, and dry wall so you don't have to worry what's behind your wall. Except that scratching noise, that's probably a rat. 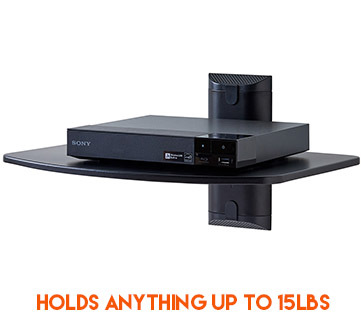 Feel safe and at ease placing multiple AV components up to 15 lbs on this shelf. That's like, supes sturdy bro. Don't have a lot of time? No worries! 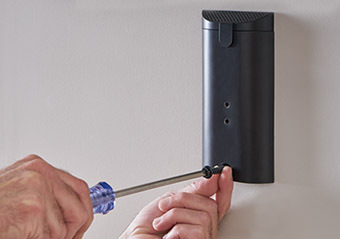 Easy installation takes 15 minutes or less. You can remove this from your checklist. 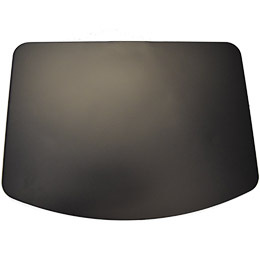 Safe, durable steel won't shatter like tempered glass. Just beware of Josh the ECHOGEAR Intern trying to dunk a basketball in your living room. Give your components the home they deserve. Before wall mounted TVs, things were pretty simple (and boring). You put your clunky VCR and cable box below the TV on some type of furniture that probably weighed 1,000lbs. 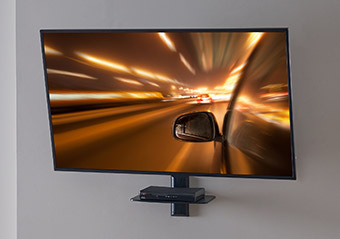 Now that flat screens weigh less than a baby walrus, mounting them has become the preferred choice of the Milky Way Galaxy (we can't speak for Andromeda). One of the best features of wall mounted shelves is the wall compatibility. 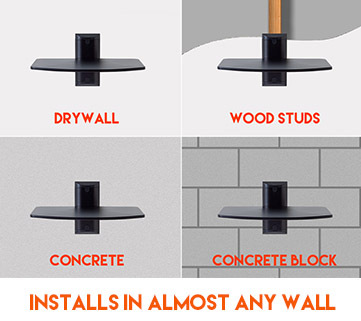 Because they can be installed in wood studs, concrete, or dry wall, you can position it exactly where you want it on the wall, no drill required. “Perfect, and it came with easy to follow instructions” -Manofteeth. 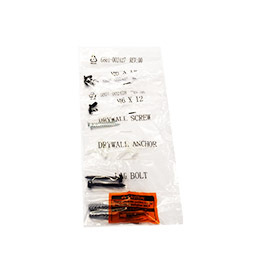 Work less, chill more with our easy install process. In less than 15 minutes you'll have this project done, which will earn you at least 4 hours of "me" time. 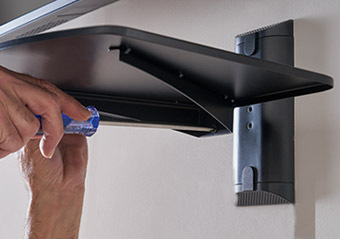 Click the button below to add the Single Steel Wall-Mounted AV Shelf to your wish list.